Disaster In Japan, Wednesday's Developments : The Two-Way The latest news on the crisis in Japan, where authorities continue to try to get aid to survivors and engineers continue to try to bring overheated reactors under control at a nuclear power plant in Fukushima. 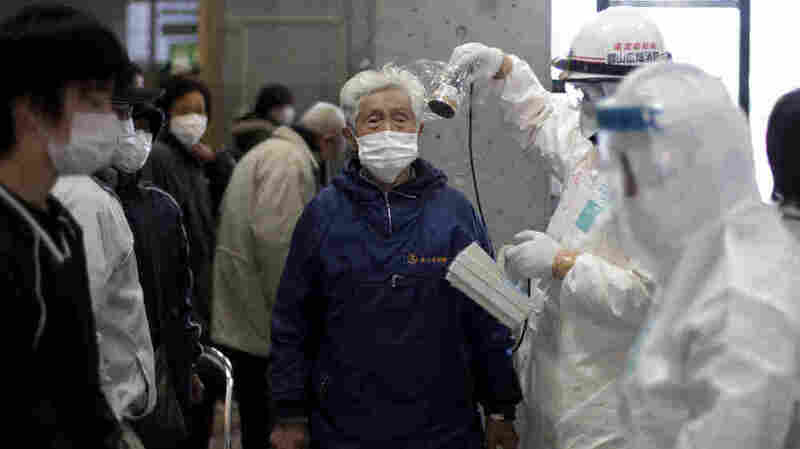 A man is scanned for radiation exposure at a temporary center for residents living close to the damaged Fukushima Daiichi plant on Wednesday, March 16, 2011. Update at 7:18 p.m. ET: In this post, we followed Wednesday's developments about the crisis in Japan, where a 9.0 magnitude earthquake set off devastating tsunamis on Friday. Scroll through to see what happened today. On Thursday morning a spokesman for Tokyo Electric Power, the Daiichi plant operator, and a spokesman for Japan's nuclear regulatory agency, denied Mr. Jaczko's account, saying the situation at reactor No. 4 had not changed and that water remained in the spent fuel storage pool. But both officials said the situation was changing and that the reactor had not been inspected in recent hours. Update at 4:45 p.m. ET. No Water In One Cooling Pool At The Nuclear Plant? "WASHINGTON — The chief of the U.S. Nuclear Regulatory Commission said Wednesday that all the water is gone from one of the spent fuel pools at Japan's most troubled nuclear plant, but Japanese officials denied it." NPR's Nell Greenfieldboyce adds that Jaczko told Congress, however, that his agency has limited information about what is happening at the crippled Fukushima Dai-ichi facility. If Jaczko is correct, Nell says, "exposed fuel could release large amounts of radiation, preventing workers from trying to cool both that storage pond, as well as crippled reactors." The plant's operator, Tokyo Electric Power Co., has denied that the pool is dry. While, as we just reported, the U.S. embassy is advising Americans who live within 50 miles of the crippled Fukushima Daiichi nuclear power plant to leave the area or take shelter, the Japanese government has recommended that action for those who are within 12 to 20 miles of the plant. "The United States Nuclear Regulatory Commission (NRC), the Department of Energy and other technical experts in the U.S. Government have reviewed the scientific and technical information they have collected from assets in country, as well as what the Government of Japan has disseminated, in response to the deteriorating situation at the Fukushima Nuclear Power Plant. "Consistent with the NRC guidelines that apply to such a situation in the United States, we are recommending, as a precaution, that American citizens who live within 50 miles (80 kilometers) of the Fukushima Nuclear Power Plant evacuate the area or to take shelter indoors if safe evacuation is not practical." The Japan Times writes that "people in Fukushima Prefecture expressed concern and rage Wednesday as radioactivity readings remained high around the Fukushima No. 1 nuclear plant and kept them on high alert." That's similar, as we reported yesterday, to what people trying to leave the area were telling reporter Doualy Xaykaothao. Update at 11:45 a.m. ET. Japan To Pour Water On Reactor Three: The IAEA reports Japanese authorities plan to drop water on the damaged third reactor at Fukushima Daiishi. The plan had been abandoned earlier due to spikes in radiation levels. Crews may also spray water on Reactor Four, the shut down unit that had a fire. A reminder: The U.S. Agency for International Development points to this list kept by InterAction.org of aid agencies that have responded to the crisis in Japan. The list includes links to the agencies' websites, which in turn have information on how to donate to their efforts. "Russia plans to evacuate the families of Russian diplomats serving in Japan" beginning Friday, Reuters reports. The decision was announced by Russia's Foreign Ministry. There have been nine earthquakes of 5.0 magnitude or above today in the same region struck by last Friday's massive, 9.0 temblor, the U.S. Geological Survey reports. The hardest quake today registered 6.0. There are now "80,000 Self-Defense Forces personnel, police officers and firefighters mobilized in the devastated areas, where temperatures have dropped to midwinter levels," Kyodo News reports. And, "the National Police Agency said it has confirmed 4,255 deaths in 12 prefectures, as of 8 p.m., while 8,194 people remained unaccounted for in six prefectures." "The day started badly at the complex, with two fires breaking out. One was at the number three reactor unit, and was followed by a spike in radiation at the site. Workers were moved away from the reactor for several hours, but government officials say some are back at the complex now. "The fire and high temperatures prompted an attempt to pour water on the reactor from a helicopter. That mission was cancelled, however, apparently because radiation levels were too high above the reactor. "Another reactor at Fukushima, number four, also produced steam or smoke earlier in the day. That disappeared, but workers are concerned about a large pool at the reactor where used fuel rods are kept until they cool. Water levels have dropped in the pool and so far workers haven't been able to get more water into it." Update at 9:40 a.m. ET. Identifying The Dead Proving Difficult: Japan's National Police Agency says it has confirmed 3,771 deaths and that 8,181 people remain missing, The Japan Times reports. With some areas still difficult to reach, the concerns over radiation near the crippled Fukushima nuclear power plant and a stretched-thin police force, identifying the dead is proving difficult. "Little headway has been made on autopsies," the newspaper says. "Given the situation, the NPA has instructed police to accelerate the autopsy procedures by using photographs. Miyagi [prefecture] police are now considering asking volunteers to handle victims' families so its officers can focus on postmortem examinations." Update at 9:10 a.m. ET. Status of Quake-Stricken Reactors: Kyodo News says partial melting has occurred at Fukushima Daiimi reactors 1 and 3; there are cooling failures at reactors 1, 2 and 3; and a fire at reactor 4, which is shut down. Update at 8:55 a.m. ET. No Immediate Risk Near Nuclear Plant? "Japan's Chief Cabinet Secretary, Yukio Edano says the level of radiation detected about 20 kilometers [12.4 miles] from the quake-damaged Fukushima Daiichi nuclear power plant does not pose an immediate health risk," Japan's NHK reports. The world is understandably watching anxiously as engineers try to bring overheated reactors under control at the nuclear power plant in Fukushima. But the human suffering and humanitarian crisis in Japan beyond the dramatic events at the nuclear facility continue. As NPR.org writes, "after an earthquake and tsunami devastated a huge swath of Japan, the nation is struggling with immediate fears of nuclear disaster while trying to get aid to millions of people and shore up the banking system. ... Up to 450,000 people have crammed into makeshift evacuation centers across the country, waiting for a return to some sense of normalcy. Millions of people spent a fifth night with little food, water or heating in near-freezing temperatures and snow as they dealt with the loss of homes and loved ones. "More than 11,000 people are officially listed as dead or missing, and most officials believe the final death toll will be well over 10,000 people." But the nuclear plant's problems are affecting the efforts to help the people. Here's a chilling headline from today's Wall Street Journal: "Relief Groups Consider Withdrawing Operations Amid Threat Of Exposure." Update at 7:40 a.m. ET: It's Not Chernobyl: Morning Edition talked to Dr. Robert Baker, co-director of the Chernobyl Project, who has studied mammals in the Ukrainian region 25 years after the nuclear disaster. He's doesn't see genetic mutations in the animals. "I'm not telling you it's not there - but I'm telling you that it's small". He also cites the World Health Organization as saying Ukrainian children born in the area have not reported a greater number of birth defects following the nuclear plant meltdown. Update at 7:05 a.m. ET: Workers Waiting To Return To Plant: NPR's Richard Harris tells the NPR Newcast that radiation levels spiked at the Fukushima nuclear complex, forcing crews to withdraw to safety. The levels have since fallen, and crews are considering ways to return to pour urgently needed water on the hot reactors. Officials say the high radiation levels didn't threaten the public outside the plant. Japanese emergency workers are struggling to contain fires and smoke at the Fukushima Daiimi nuclear complex. The scope of devastation from Japan's huge earthquake and tsunami is becoming more clear. Kyodo reports smoke billowed out from Reactor Number Three; the same reactor earlier suffered an explosion and experts fear the radioactive core has partially melted. Emergency workers were evacuated out of Reactor Number Three for safety, according to Japan's Chief Cabinet Secretary Yukio Edano. "The workers cannot carry out even minimal work at the plant now," he said. They'd been trying to flood the damaged reactors with seawater to cool them off. A plan to drop water on the damaged reactor buildings by helicopter was abandoned. There are six reactors at Fukushima Daiichi complex. Reuters says crews are pouring water into Reactors Five and Six, even though they're offline. That's because Reactor Number Four was also offline - and it suffered a fire Monday. Kyodo says the temperature is rising slightly at the spent fuel pools. NPR's Rachel Martin tells Morning Edition the U.S. military has ordered more than a dozen vessels to Japan to help the relief effort and they've delivered 25 tons of aid already. Some ships had to change course as a precaution because they detected low levels of radiation. They've moved northward 180 nautical miles but continue to fly in supplies. The Navy has also seen 'miles and miles of floating debris' from the devastating tsunami. And Japanese Emperor Akihito gave a rare public address Wednesday, saying he's deeply concerned at the unpredictable events and urged all Japanese to treat each other with compassion. Akihito also thanked emergency workers and the dozens of foreign countries who've given help to Japan.